The propeller on the inboard engine of their plane spun off while on a bombing run over Japan. It hit the outboard engine and knocked it out, too. The Superfortress had to fly the 700 miles back to Iwo Jima on two engines. “We had some general from the Pentagon flying copilot on our plane,” the 87-year-old Punta Gorda, Fla. man recalled. “We were the pathfinders that led the rest of our planes into the target that night. “After we dropped our fire bombs, the general wanted to take a closer look at the city. We ended up circling the burning city flying 7,000 to 8,000 feet above the ground,” Wallace said. Some 200 to 300 B-29 heavy bombers attacked Japan’s capital city that first night. It was just one of many raids over many enemy cities by the 20th Air Force during the spring and summer of 1945. It seemed to the 26-year-old radio operator aboard “Pride of the Yankees” like they circled low over the burning enemy city forever. They finally left and returned to their base on Saipan more than 1,400 miles away because they were running out of fuel. 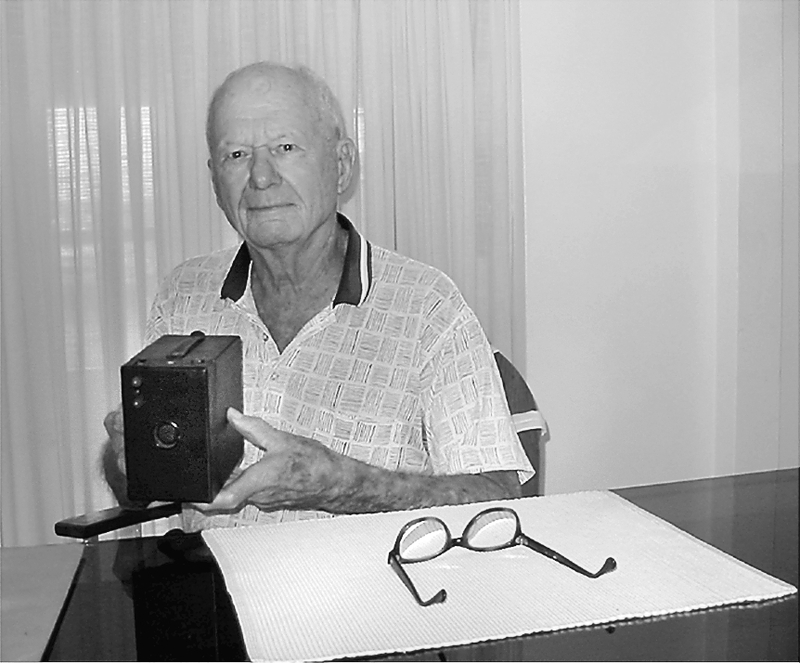 Wallace took this picture of Fuji with his Kodak Hawkeye camera. 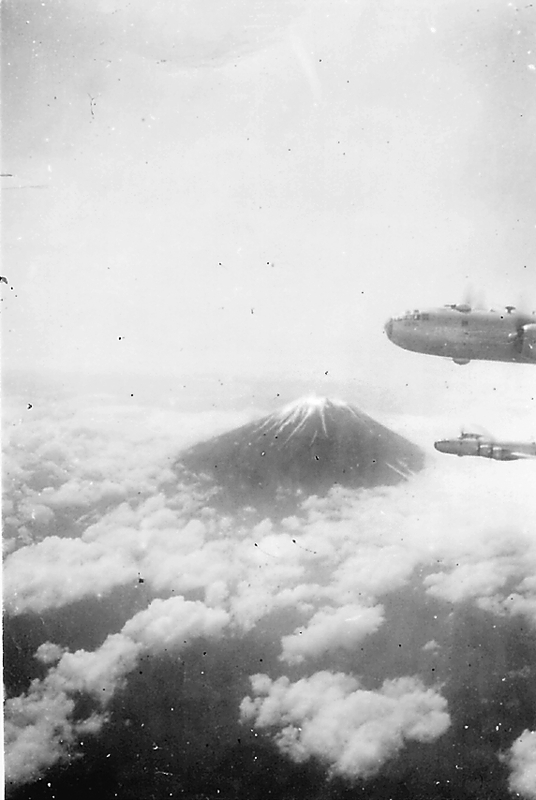 It shows a couple of B-29s in formation flying by Japan’s most famous mountain. The closest call Wallace and his crew had to disaster during the 37 missions he flew over Japan was on one flight when both inboard engines on their bomber developed engine trouble. “We had made our bomb run and right after we left Japan, two of our engines started overheating as the oil pressure dropped,” he said. “Our engineer told the pilot we were losing oil pressure and he needed to feather the props on the problem engines. “We were flying home to Saipan when the engineer told the pilot what the problems were,” he said. “If you wouldn’t feather the props, the engine would spin out of control and eventually seize up and fly off. “The B-29 was a wonderful airplane that could carry 40, 500-pound bombs, 20-tons of bombs long distances with 6,800 gallons of gasoline. However, this put a lot of load on its four engines,” Wallace explained. “There was also a fire problem with the engines because they were made of magnesium alloy. When they caught fire they would go up like a tender box. “It was March 1945 and we still had a couple of hours to get back to Iwo Jima. The Marines had just taken the island. We feathered the props and made it safely back to Iwo. “We lost our two outboard engines on one flight right after we left Japan on another bomb run. 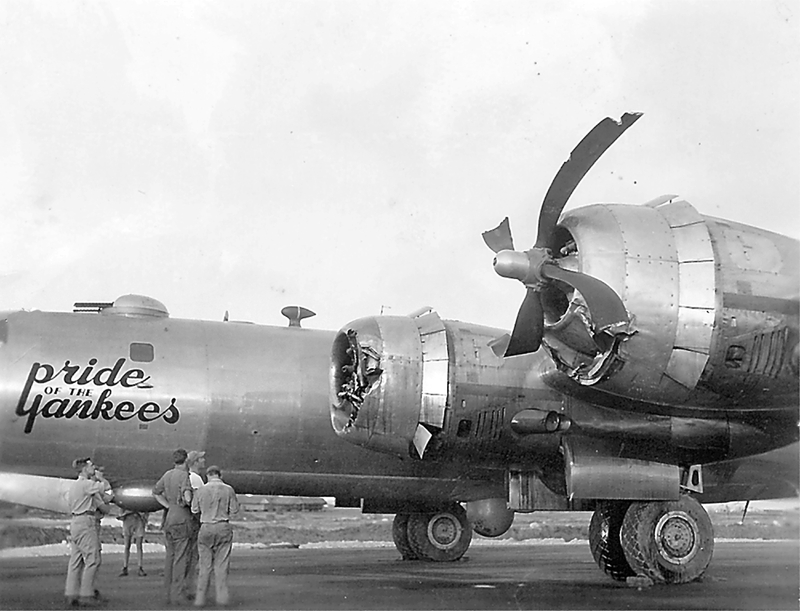 “Early on, B-29s had lots of engine troubles. During the year we flew missions, our plane had 18 engine changes,” Wallace said. The hairiest time aboard “Pride of the Yankees” came when Wallace and his crew sat out a flight and another crew flew the bomber on a raid over Japan. 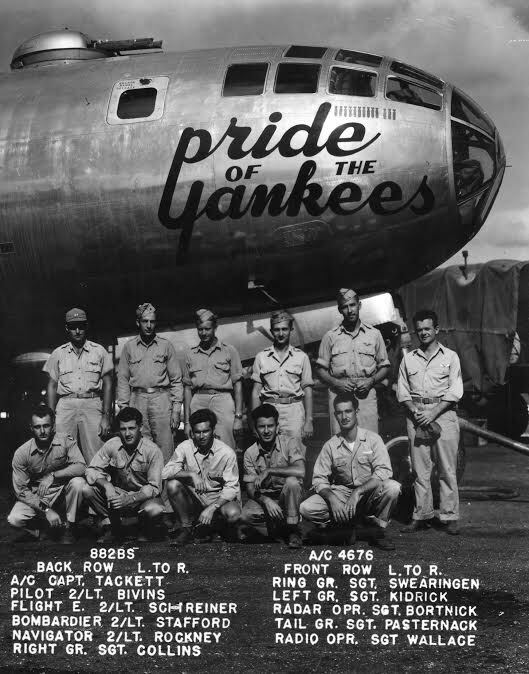 “Pride of the Yankees” was one of the early B-29s to fly off Saipan. They arrived on the island with their bomber in October of ’44 and flew their first mission on Nov. 24, 1944. Their last mission was flown July 9, 1945. This is Sgt. Bob Wallace with his revolver strapped on him standing in front of a Quonset hut in 1945 near the end of World War II. Wallace joined the Air Force in 1942 because he didn’t want to end up as a “foot slogger” in the Army. Wallace was 25 and had just gotten married. He was working for Atlanta Light and Gas Co.
After training as a radio operator, he was told that his group was being trained to fly as part of a B-29 crew. This new generation of bombers was not even ready for war yet. 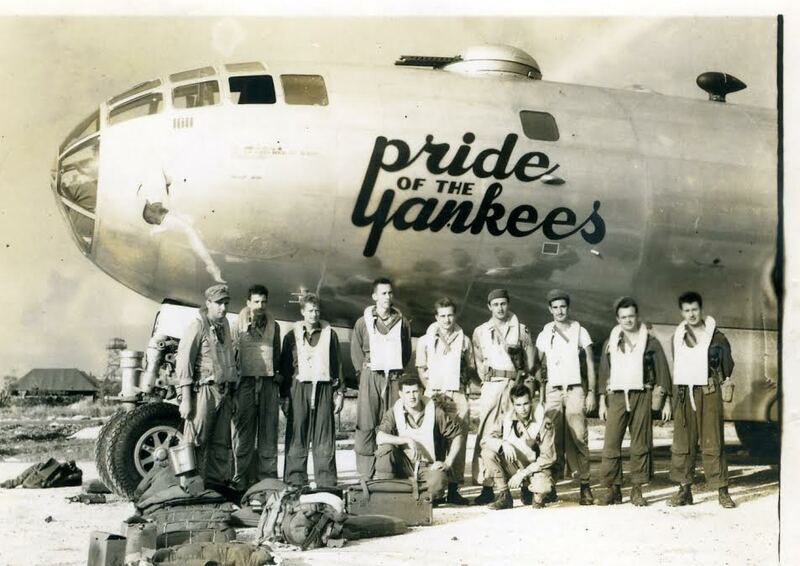 In the fall of 1944, the “Pride of the Yankees’” crew finally got its B-29. A short time later they were sent to California. From there they flew to Honolulu, Kwajalein and finally Saipan. When Gen. Curtis LeMay took command of the 20th Air Force in early 1945, he quickly realized the air crews were having considerable trouble hitting their targets. “There was no compensation in our bomb sights for a head wind like that. For a couple of months we dropped our bombs on the wrong targets because of the jet stream,” he said. ‘”Shortly after LeMay arrived, he called all the air crews flying bombing raids together for a critique. He asked the navigator in the lead plane to stand up and take a bow because we weren’t hitting our targets. A voice in the rear of the audience spoke up and said, ‘General, I think he’s on sick leave today.’ That brought a laugh from the crowd,” Wallace said. For the next several weeks, the 20th Air Force had bombing practice until they could hit their targets. LeMay also cut the altitude on their bombing runs down from 30,000 feet to 7,500 feet, which made them much more accurate. Wallace’s last official mission was in July 1945. However, he flew two extra missions beyond the 35 needed because a serviceman was rotated home. He flew the extra two as a fill-in radio operator because the bomber group was shorthanded. Commendations: Distinguished Flying Cross, Five Air Medals, Pacific Theater Medal, World War II Victory Medal. This story was first printed in the Charlotte Sun newspaper, Port Charlotte, Fla. It is republished with permission. Robert B. 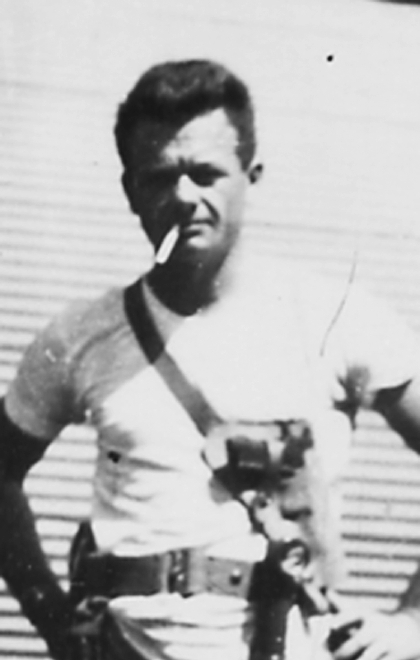 “Bob” Wallace, 94, of Punta Gorda, formerly of Atlanta, Ga. died March 1, 2011. Services will be at Greenwood Cemetery in Atlanta, Ga. Roberson Funeral Homes & Crematory Punta Gorda Chapel, is in charge of arrangements. My Uncle Bert was the navigator on the “pride of the Yankees” that lost both its engines on one side. (photo at top of page) I would love to hear more stories about that flight. Thank all of you for your service. Sure wish he was down here and I could do a war story on him. My great Grandfather was the pilot. Lt was his rank and his name was Frank A Carrico. My Great Grandfather flew on the,”Pride of the Yankees”. He was known as the last man out if enemy skies. My father was a pilot on the Pride of Yankees, his name is Hervie Dillingham Jr. I want thank you Mr. Wallace for your story. If your father was flying Pride of the Yankees when it came back to Iwo Jima with both engines out on the port wing he performed a miracle getting that ship back on the ground almost in one piece. It’s a great story about a great airplane. Do you have the date of this flight? The photo says the flight landed at Iwo but later in the article it says Saipan. Thom, good to see your comment here! My father (Frank) was radio operator on your father’s crew. My dad, 1st Lt. James M Stafford, was also a crew member of Pride of the Yankees. He was navigator/bombardier for many of the runs from Saipan to Tokyo, with Capt. Cecil Tackett at the controls. They earned the DFC and Air Medal. Thanks for your story! I’ve heard about it all my life, and a first hand account of the run with two engine props destroyed is amazing. Dad died April 28, 2011 in Garland, Texas. All the crew members of Pride of the Yankees were great heroes! My son is today an attorney on Saipan. An interesting place to visit to re-live our fathers’ experiences. Don’t know if your father was aboard when both engines went out and they limped back to Iwo Jima but if he was it must have been one helluva ride. The bomber obviously played a significant role in convincing the Japanese they didn’t want to continue the fight with people like your father. My father, Warren C. Schreiner, was the flight engineer that Robert Wallace mentions in the story of the time that two inboard engines failed. According to Dad, they had a full-bird colonel on board and he was instructing Capt. Tackett to ditch the plane. Tackett asked Dad about the condition of the other engines, which Dad replied that they were fine and they had plenty of fuel to make it back to Saipan. Over the objections of the colonel, Capt. Tackett overruled his orders, as only the pilot could, and flew back to base, feathering the inboard engines all the way back. The full-bird colonel was decorated for the incident. Tackett and his crew got bupkiss. Dad passed away May 18, 2014, and may have been the last surviving member of Tackett’s crew. If you’re intersted, I have a photo of Tackett and his crew with Robert Wallace, Donald Swearingen, and James Stafford, who are mentioned above. Would be happy to send that and others along. Just let me know where to send them. Please write a few lines explaining the pictures. My associate will know what to do with them. Thank you for the additional information to Wallace’s story. Much appreciated. The man in the top photo of the B29, white tee shirt and fatigue hat was my Uncle Frank Carrico (his nickname was Chico). He was the substitute pilot of the Pride of the Yankees shown above when both port engines were knocked out. Couple years ago Uncle Frank went with us to the Dayton Air Museum where a B29 and many other WWII aircraft are displayed and the stories unfolded. He never spoke about WWII until his last couple years. Incredibly robust 93 year-old it was an honor to hear the story from him personally and I can attest that the firebombing of Tokyo and civilians bothered him until his passing. Frank Carrico passed away a little over a year ago and he was something special. I know I am just finding this years after the post. I just wanted to let anyone interested, that I have a facebook page called Walker Army Airfield WWII B-29 Training Site. The Airfield which is located in my hometown of Walker, KS is where the 882nd Squadron, 500th Bomb Group, 73rdWing, 20thAir Force, including Pride of the Yankess trained. Would enjoy having you see some of the photos and information I have posted over the years. My father, Warren Schreiner, was the flight engineer. Before he died in 2014, he had related a time when they had a full bird colonel on board. When the plane was struck by flack, knocking out 2 engines, the colonel ordered the pilot to ditch the plane. Fortunately, while the plane was in flight, the pilot out ranks anyone else on board. The pilot asked my father about the condition of the other engines, and he replied that as long as the two damaged engines were feathered they would be able to make it to Iwo Jima, which is what they did. After the incident, the colonel was given a medal, the crew got bupkiss.